Travelling abroad is great, but sometimes it’s nice to explore places a little closer to home. 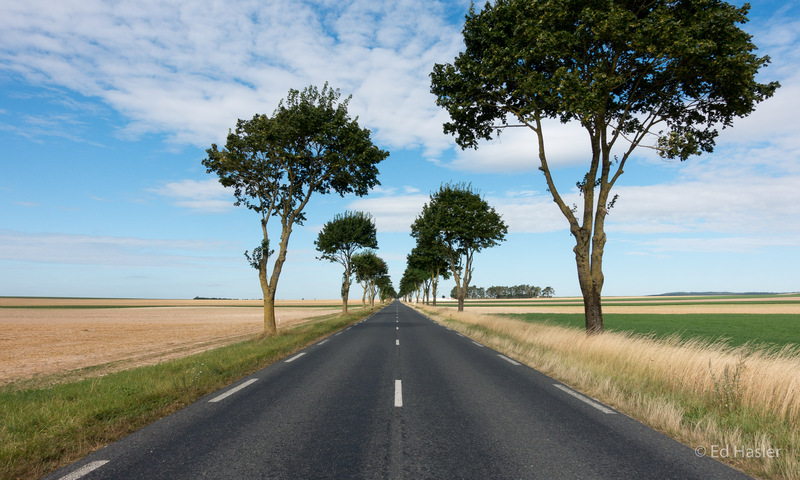 As my girlfriend lives near York, I often spend time in Yorkshire, but haven’t explored the area as much as I’d like. 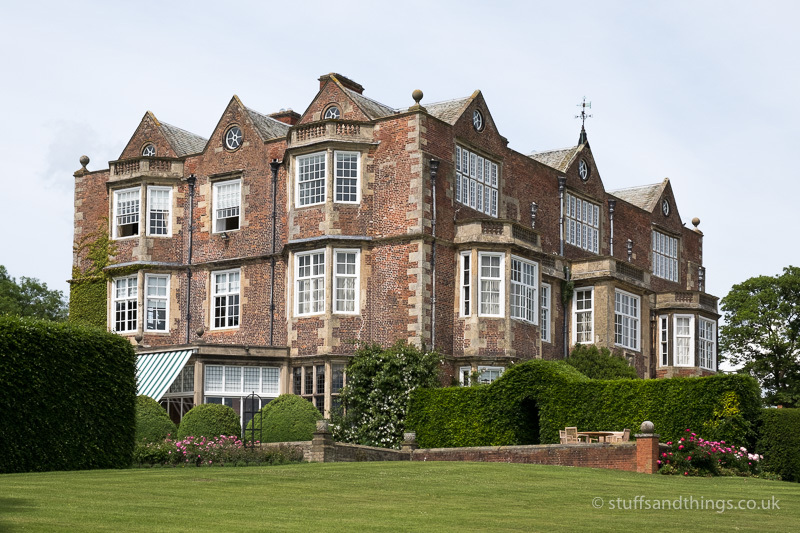 To remedy that, I decided to book us a nice weekend away at a 5 star stately home called Goldsborough Hall, located a few miles east of Harrogate. I’m always on the look out for interesting places to visit, and the thing that led me to find Goldsborough Hall was a photo of a bath I’d seen on the internet. However this wasn’t just any bath, and if you read more you’ll see why! Having discovered the location of this amazing bath, I was pleased to discover that it was only a few miles from where my girlfriend lived. Looking through the website, it looked like a lovely place to spend a relaxing weekend so I booked a 2-night deal with dinner included. 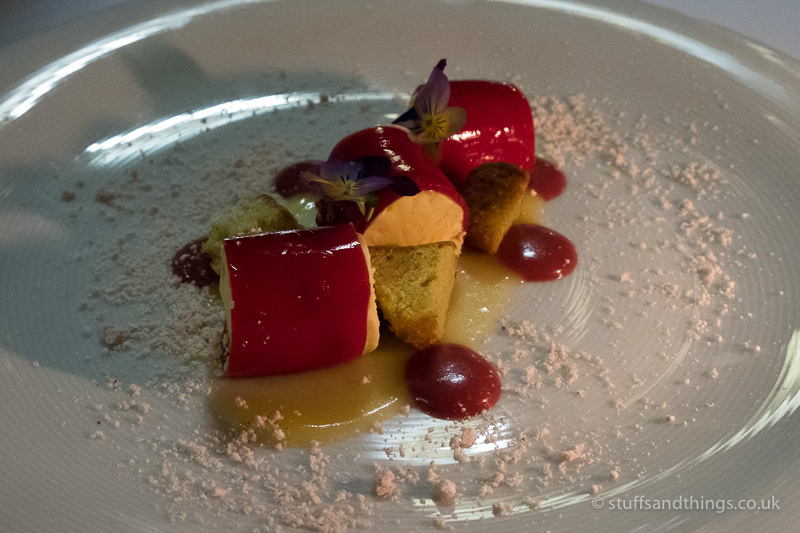 I also booked us in for a rather tasty looking afternoon tea on the Saturday, and as if that wasn’t enough food – lunch in their dining room on Sunday. 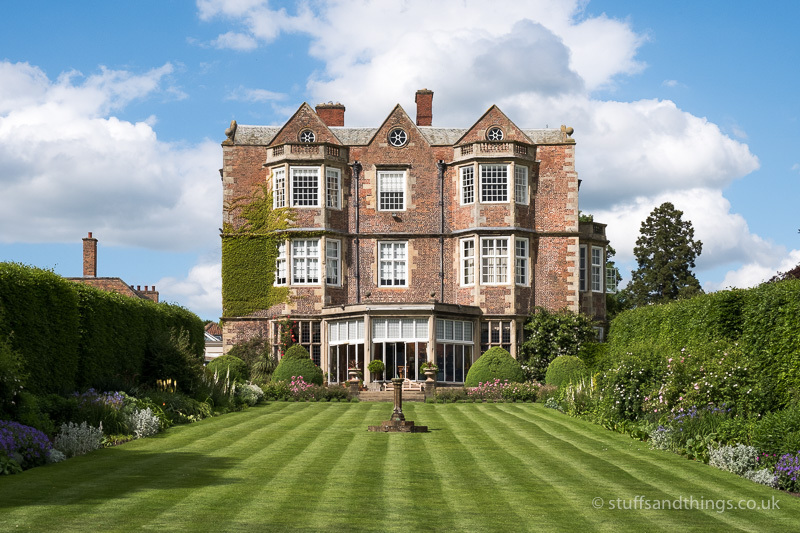 Goldsborough Hall isn’t just a luxury B&B – it’s a stately home with royal connections. Originally built in the early 1600’s, it has over 400 years of history. It was even occupied during the English Civil War by Oliver Cromwell’s army, while they destroyed nearby Knaresborough Castle. 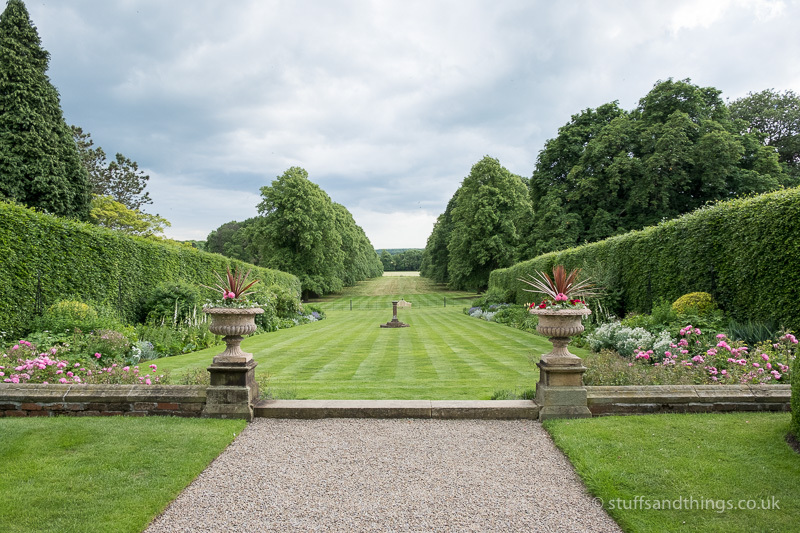 In the 1920s it was home to HRH Princess Mary, the Queen’s aunt, who made a number of improvements to the impressive gardens. Since then, it has also been a school during World War II, and even a nursing home for 20 years between 1983 to 2003. After BUPA closed the nursing home, it was eventually purchased by the current owners who restored the property and turned it into a family residence, as well as a B&B with 12 luxury guest rooms. With this history, it was obvious this wasn’t going to be a typical stay in a country B&B! We arrived late-morning on the Saturday, and I parked the car in the car park at the front of the hall. As we unloaded our bags, I took a moment to take in the splendour of this building that would be our home for the next couple of days. It was apparent straight away that a lot of care is taken to keep the building looking good, and not long after we arrived I noticed someone with a small tractor raking the gravel to remove unsightly tyre tracks. I did feel a little guilty later when I moved the car around to get some photos! As we were booked in for an early afternoon tea, it was a couple of hours before the usual check-in time. Fortunately, as as our room hadn’t been occupied the previous night, we were able to check-in early and it wasn’t long before we were led up to our room on the second floor. I’d booked the largest room in the hall as this was the one that featured *that* bath, and the room did not disappoint! 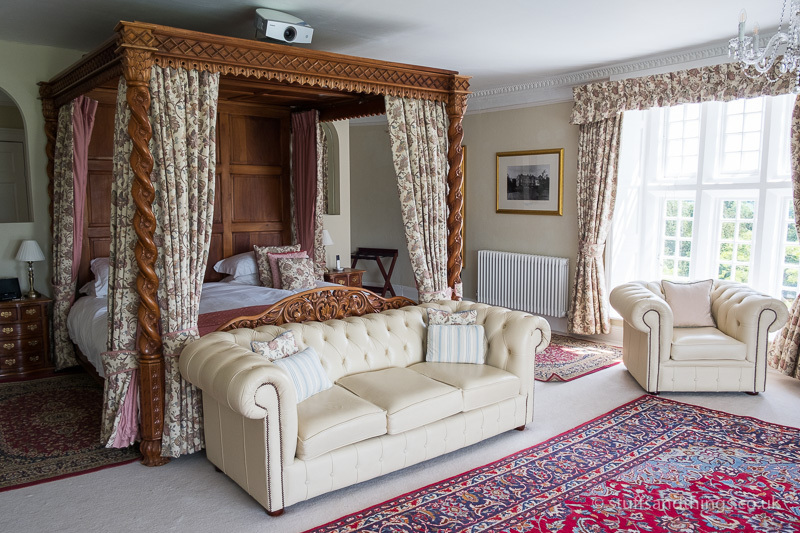 It’s advertised on their website as the Presidential Suite, but is actually called the Lascelles Suite – named after the Lascelles family who owned Goldsborough Hall from the 1750s to the 1950s. Henry Lascelles married Princess Mary (the only daughter of King George V and Queen Mary), and they lived at the hall after their wedding in 1922. This suite was actually used as a day nursery for Princess Mary’s two sons, so it really is a room fit for royalty! The first thing to catch my eye was the large four-poster bed which is very impressive, but then you see the bath – and wow! This bath isn’t tucked away in the bathroom, but takes centre stage at the front of the room. It’s sunk into the floor next to the bay window, with views across the beautiful gardens and Lime trees. We didn’t have long to admire the view though, as afternoon tea was booked at midday, and I was feeling hungry having deliberately skipped breakfast that morning. 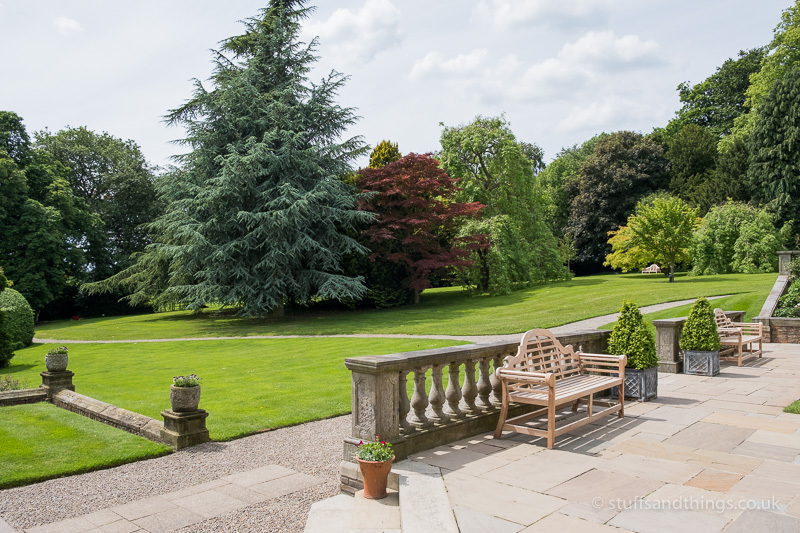 There was a choice of eating on the terrace or in the Orangery – and as the sun was out, we chose the outside terrace. We placed our order for tea, and it wasn’t long until our lunch was brought out. This didn’t disappoint, and we were presented with a platter full of tasty-looking sandwiches, scones and cakes. We tucked in to the finger sandwiches to start with, and these were packed with very tasty fillings, including curried chicken, prawn, ham and cucumber. The freshly baked scones were equally delicious, with (home-made I think) strawberry jam and clotted cream – possibly the best scones I’ve ever tasted! It was quite difficult at this point to find room for all the cakes (even though they look so small! ), so we had to admit defeat and take what was left back up to the room to enjoy later. 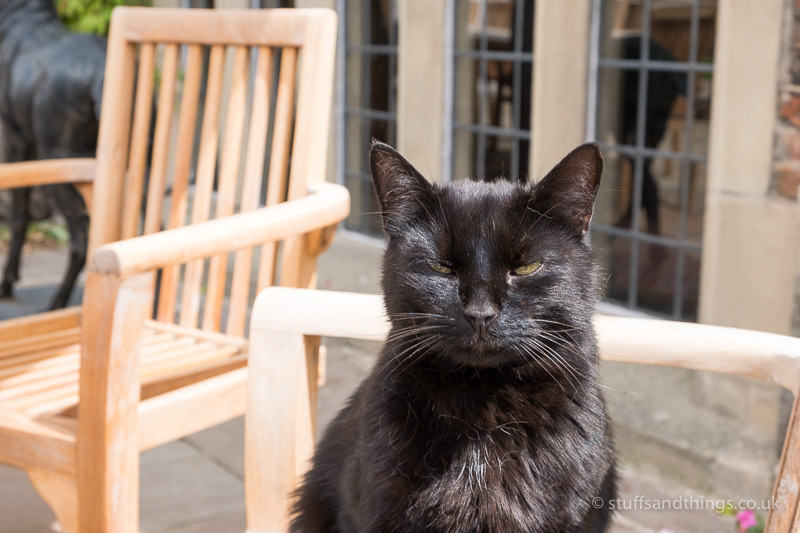 At this point, we met one of the family who owned the hall – a very friendly black cat called Parker. He seemed to be enjoying the sun as much as we were, and I’m sure was eyeing up some of our afternoon tea as well! 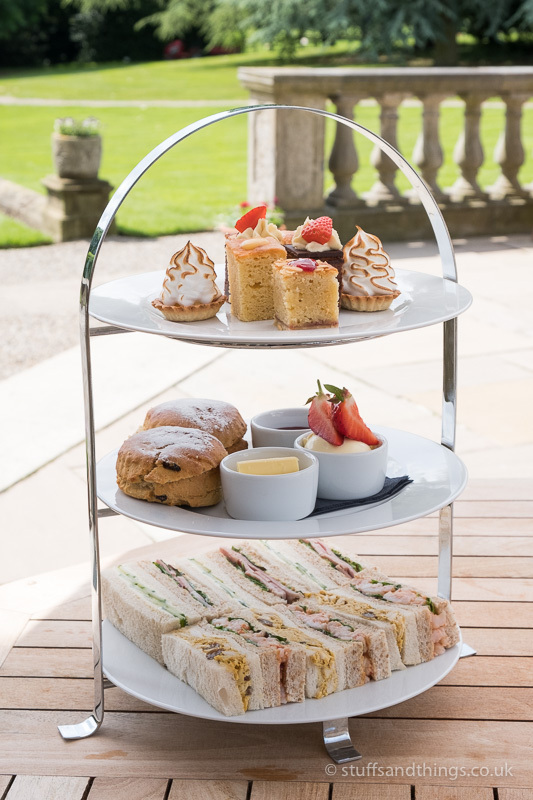 Not only was the afternoon tea delicious, but we enjoyed it in beautiful surroundings, as the terrace looked out onto the immaculate landscaped gardens. To help walk off some of our lunch, we went for a wander around the gardens. 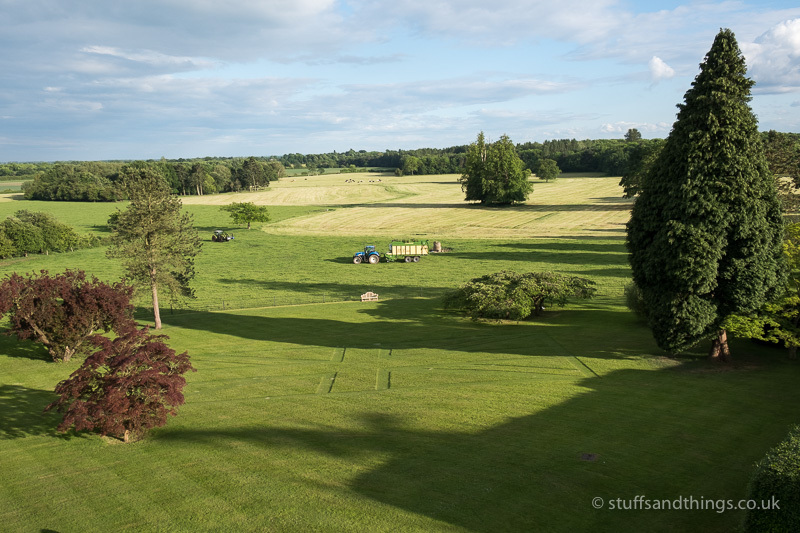 There are some 12 acres of grounds that surround the hall, so plenty of opportunity for exploring. 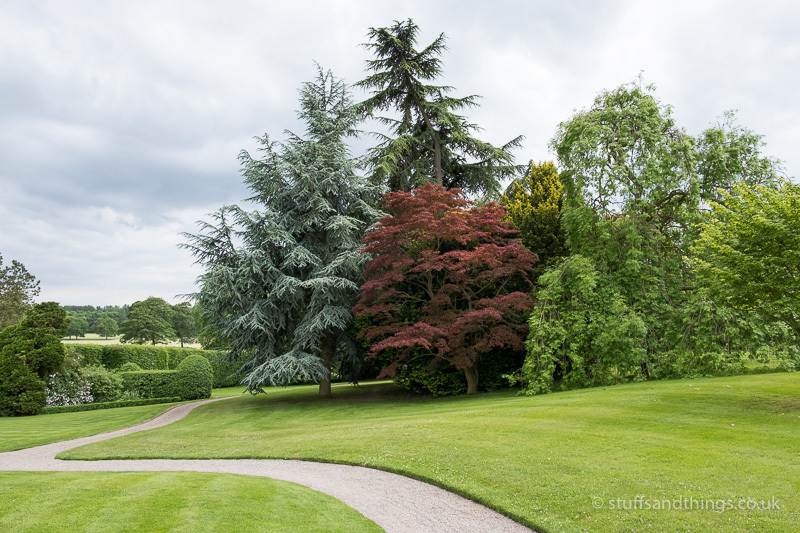 The most striking part of the grounds are the royal gardens, which feature Princess Mary’s sundial in the middle. 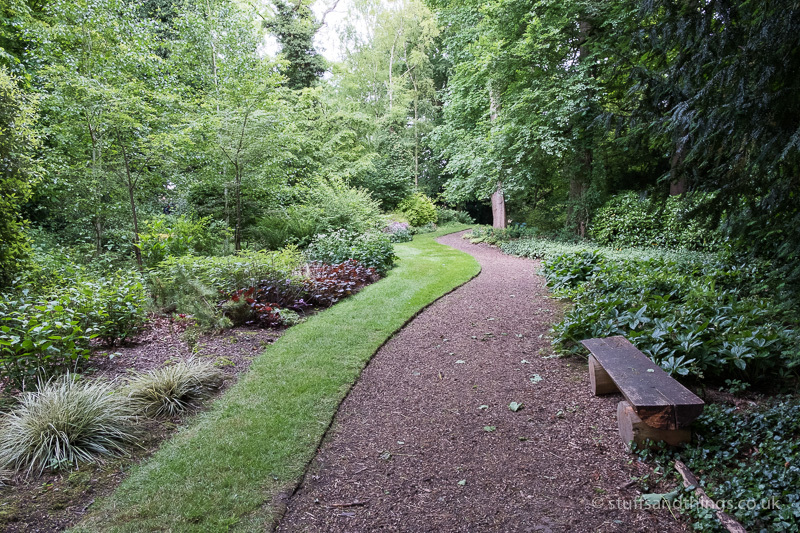 The garden leads down to a row of large lime trees. 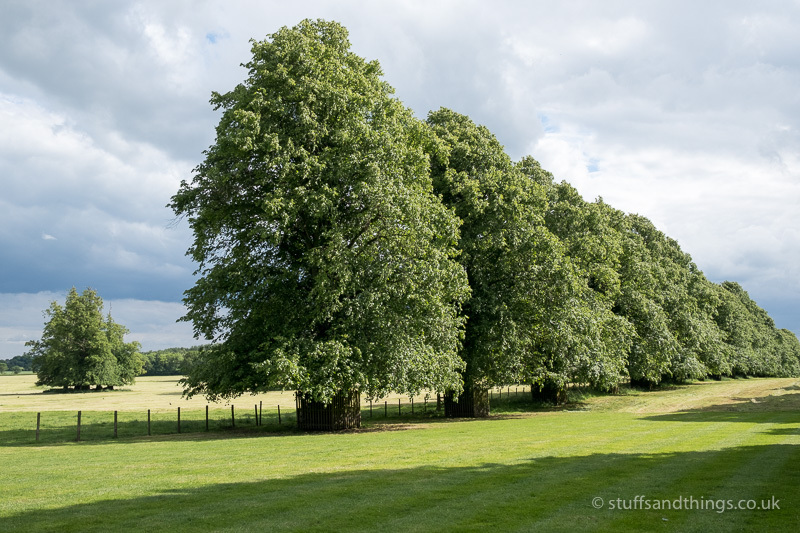 The interesting fact about these lime trees is that they were planted by visiting members of the royal family. Further round to the front of the hall, there are some Japanese cherry trees. These were a wedding gift from the Emperor of Japan. At this point, it was time to head back to the room and make the most of the amazing bath! Of course, we had to order some bubbly to go with the bubbles in the bath! 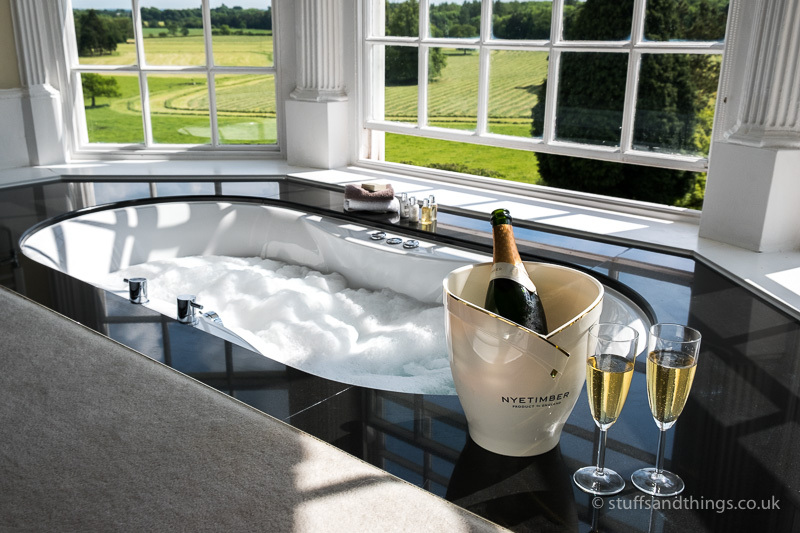 As the bath filled up, a bottle of Nyetimber Blanc de Blancs was delivered for us to enjoy! There is something very decadent about enjoying a bottle of excellent sparkling wine in a bath fit for royalty. As we sipped our wine and admired the view, it was as if the outside world didn’t exist. However all good things come to an end, and after a couple of hours of enjoying bubbles in the bubbles it was time to get out and get ready for dinner. 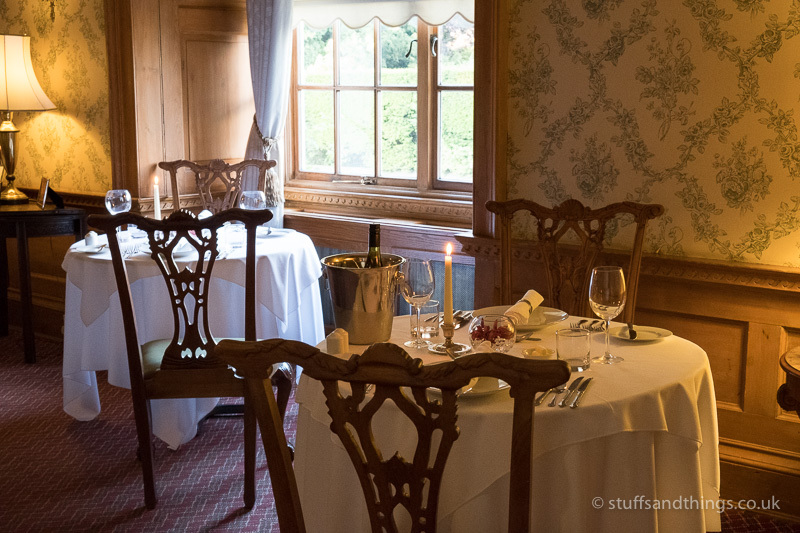 Dinner was served in the dining room, which was an intimate affair with candle-lit tables. There were various vintage photos of the hall many years ago, as well as previous residents. This added to the feeling of history, and made me feel very much at home. Dinner itself lived up to expectations, and was very tasty – although I’m not sure how I managed to find room after the afternoon tea earlier! After dinner, we retired to bed and watched a bit of TV on the 150″ projector screen in the room. This was very impressive, and even had full surround sound. There were a multitude of remotes, but plenty of instructions of how to operate everything. After a good night’s sleep in the huge four-poster bed, we awoke and headed down to breakfast. It was a struggle as food was the last thing we needed after the previous day of eating! However it was hard to resist what was on offer, and very soon our stomachs were even fuller. 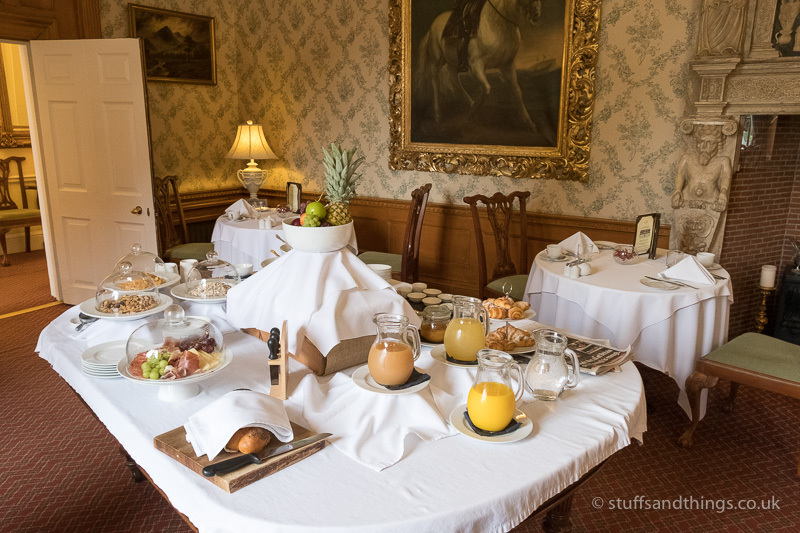 As well as a relatively small but tasty selection of meats, cheese and croissants, they also offered a menu of cooked breakfast made from locally sourced ingredients. After breakfast, we needed to burn off some of those calories, so wandered around the rest of the grounds that we hadn’t seen the previous day. This included a loop through a small woodland. It was lovely to just walk round slowly, admiring the very well maintained grounds. As we finished the woodland walk, we were back outside the hall, and it was so relaxing just to stop and take it all in. Before long though, it was time for more food! This time instead of an afternoon tea, I’d booked us in for a roast lunch. There are other choices on the menu, but as it was Sunday and I love a good roast, they didn’t even get a look in! 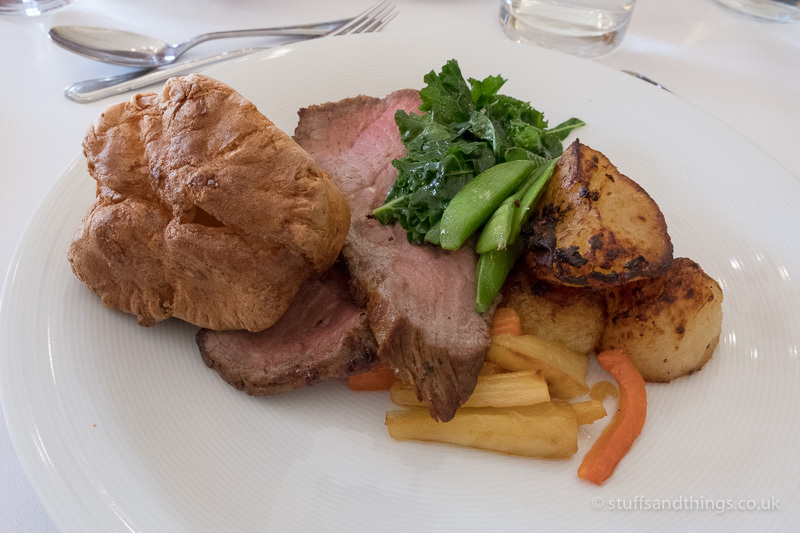 As expected, the lunch was delicious, with a large helping of perfectly cooked beef and a very tasty Yorkshire pudding. Although being in North Yorkshire, I wouldn’t have expected anything else! 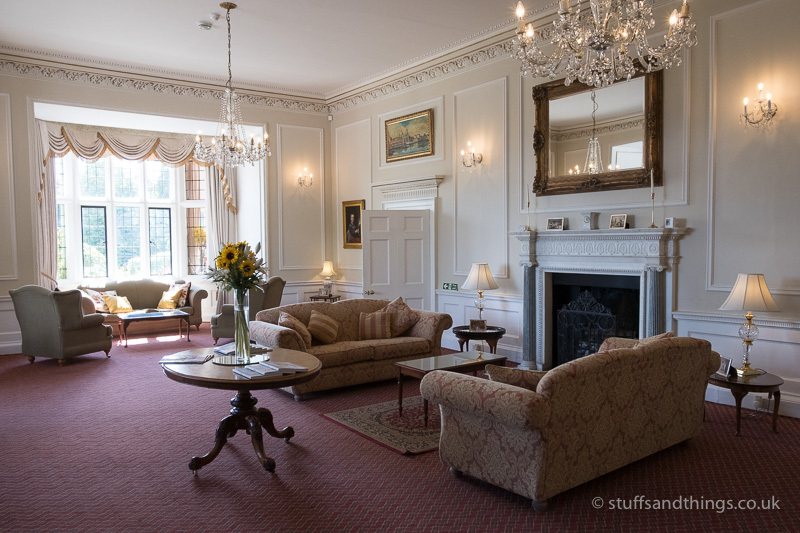 After lunch, we retired to the Princess Mary Drawing room to relax on the comfortable sofas. It’s a beautiful room, and the large windows provide plenty of light. It was a very pleasant place to spend an afternoon relaxing and reading. After a very relaxing afternoon, it was time for our final evening meal. 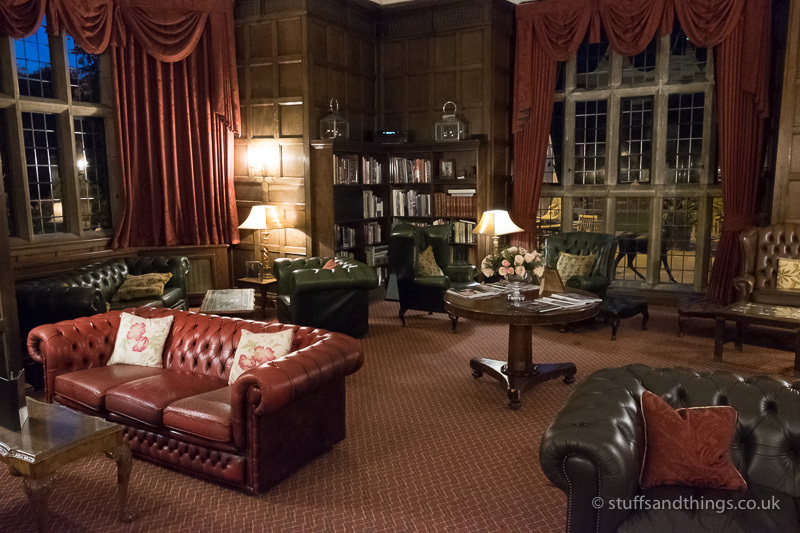 We relaxed in the Jacobean Library, where our food and drinks order was taken before going through to the dining room. This was another lovely room with a lot of character. I’d love to come back here during winter, and enjoy a drink next to a roaring log fire. 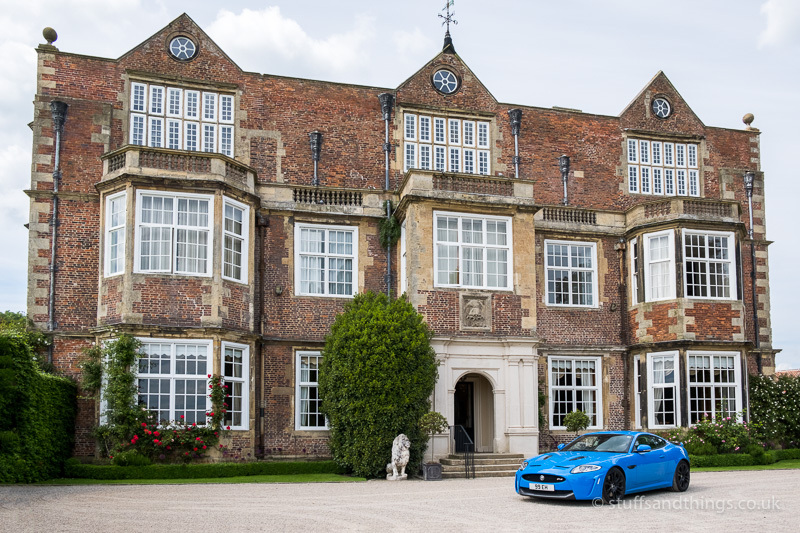 Overall, this was a very enjoyable stay in a stunning stately home. From the moment we arrived, we were looked after by very attentive staff, but in a way that wasn't obtrusive. Everything was of high quality - from the food to the gardens. It wasn't cheap, but sometimes it's worth paying a little more for something special - and in this case it was worth every penny. 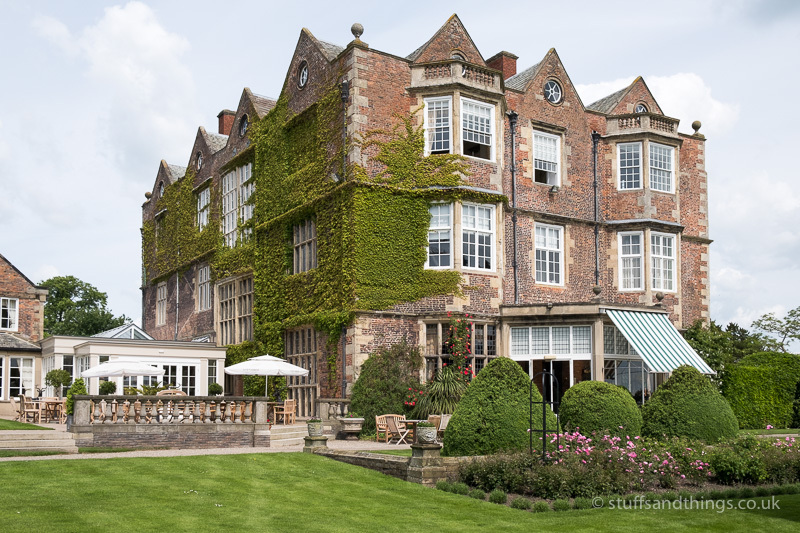 This isn't your typical 5 star luxury spa hotel, but staying at Goldsborough Hall lets you escape the outside world, and to live like royalty even if it's just for a weekend. 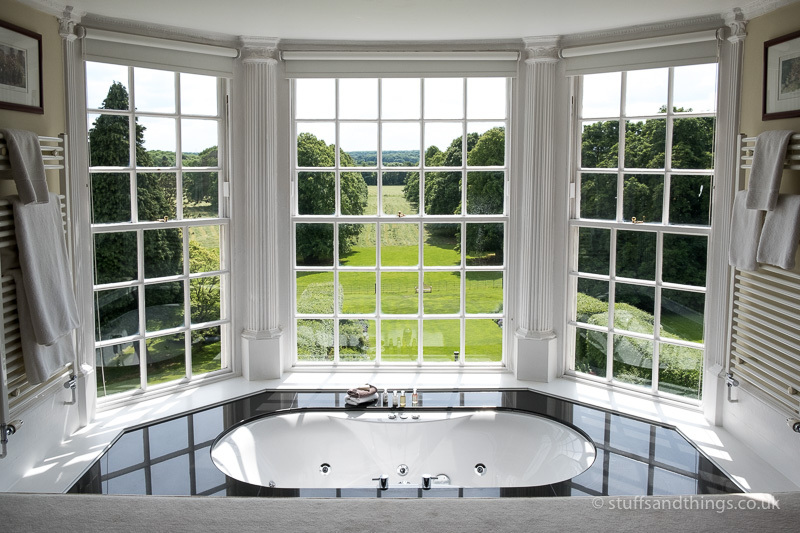 Plus where else will you find a bath with a view like that?